Our Insect Based (75%) Meal Replacement Gel for Insectivorous Species of Reptiles and Amphibians. 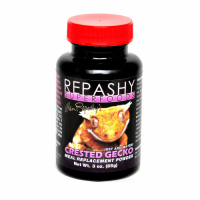 Great for Bearded Dragons, Skinks, Dwarf Monitors, Leopard Gecko, Fattail Geckoes, Salamanders and more. Insects are raised in the USA on high quality ingredients! Nutritionally speaking, Repashy Grub Pie consists of nearly 80% cold-pressed black soldier fly larvae. Cold-pressing removes about half the fat content without the high temperatures and chemical exposure of other processes that can denature proteins and degrade nutrients. 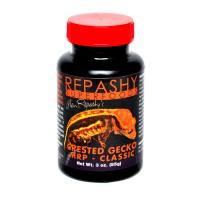 This process lowers the fat content of soldier fly larvae to a more ideal 12%, which in turn increases the protein values to over 55%. 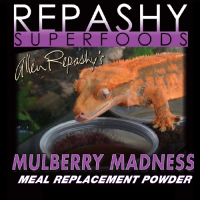 The meal also contains a nearly perfect 2:1 calcium to phosphorous ratio. 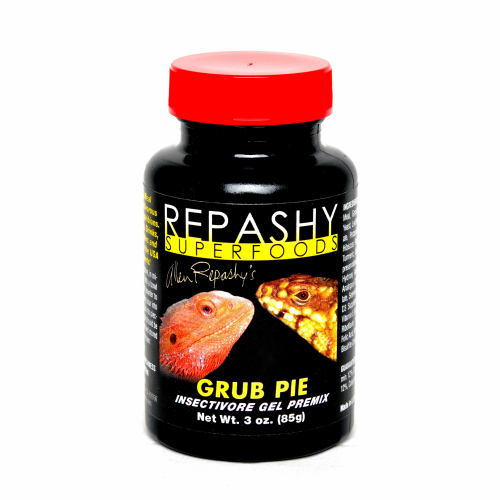 It takes over 1,000 BSFL to make one ounce of Repashy Grub Pie, and one kilo of Repashy Grub Pie contains 35,000 BSFL, whichhas a superior nutritional density than 50,000 mealworms!